Each year we create a special pre-departure package for students who are traveling with us! Continue reading to find out what’s inside (and more behind why we designed and included each piece). Rustic Travel Poster – NEW for 2018! Now you have the perfect way to track your #sorustic travels. Using the sticker sheet included in the pre-departure package, you can start mapping out where you’ve been, where you’re going in 2018, and where you want to go next year (hellllloooooo bucket list!). Rustic Pathways Foundation Postcard – NEW for 2018! What exactly is the Foundation and how does it impact your Rustic trip? The Foundation is Rustic’s nonprofit division. The Foundation aims to amplify the impact you’ll make while traveling and allow our team to provide greater support to our community partners year-round. Stay involved with your international service project after your travels by becoming an Impact Ambassador. To create this year’s design, our graphic designer Julia Vann drew inspiration from the National Parks Service posters and vibrant color-block style. Remember to wear your Rustic t-shirt on travel day! Rustic Airport Coordinators and Flight Leaders will be wearing a maroon version of the t-shirt. Want to see what previous Rustic t-shirts looked like? Check out this video. We dug up t-shirts going all the way back to 2007. That’s 10 years of Rustic shirts! Wear this in addition to your Rustic t-shirt during travel day and throughout your trip. It has our emergency number on it…just in case! International SOS is a leading provider of international medical, security, and travel assistance. Students receive a membership with International SOS upon enrollment, providing access to travel safety and security information consultations, and vaccination recommendations. The ID card includes a 24 / 7-accessible phone number and email address should you have any questions before or during your trip. This is a great piece to share with your family members and hang on your fridge, or wherever you and your family keep important, shared information. Packing for your Rustic trip has never been this easy. We’ve curated travel kits with high-quality gear recommended by travel experts. The best part? 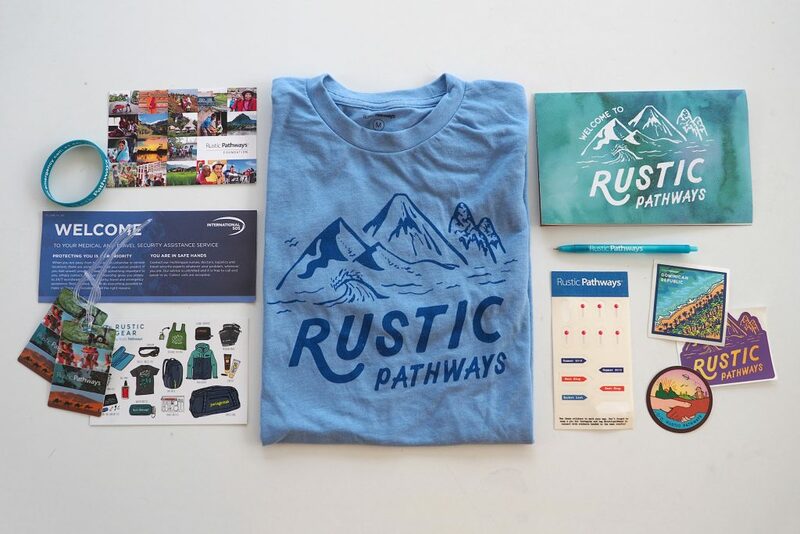 100% of the proceeds from Rustic Gear go directly to our Foundation, which supports communities in their efforts to implement sustainable solutions to high-priority development challenges. We wanted to make it easier for you to record those memories in your travel journal? If you don’t already, it’s really easy to keep a travel journal. Read why a seasoned traveler thinks it’s so important to journal. 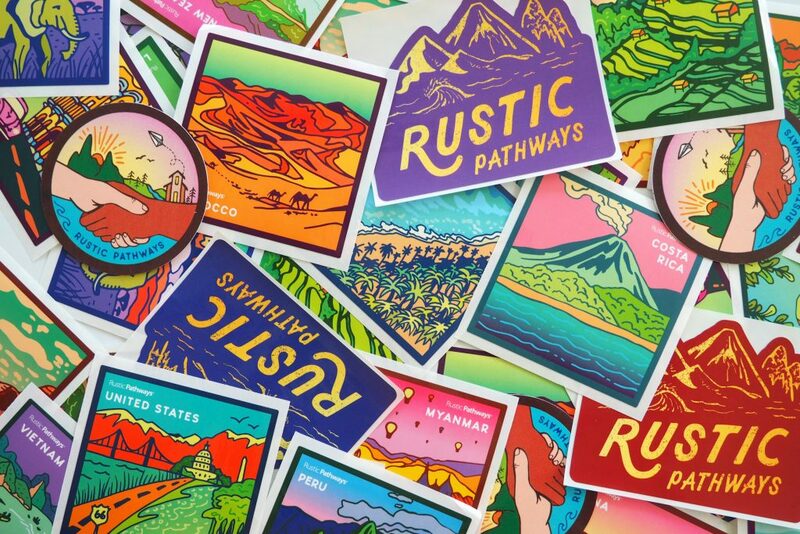 You’ll get a sticker with the name of the country or countries where you’re traveling and another general Rustic sticker to put wherever you want. Decorate a water bottle, share with a friend, or put them up in your bedroom or locker—it’s up to you! Please let us know if you have any questions about your pre-departure package. Happy traveling! If you have any questions about how to choose a program, request a call from one our global travel experts. Rachel joined Rustic in 2013 and led programs for three summers in Costa Rica, Peru, and Ghana. She’s also led programs in Fiji and Tanzania. A graduate of the University of Vermont with degrees in sociology and Spanish, Rachel focuses her love for travel, writing, and her unquenchable curiosity of our natural world as Rustic’s Brand Engagement Manager. Based in Tahoe, CA, Rachel is a talented ceramicist and lover of the outdoors.